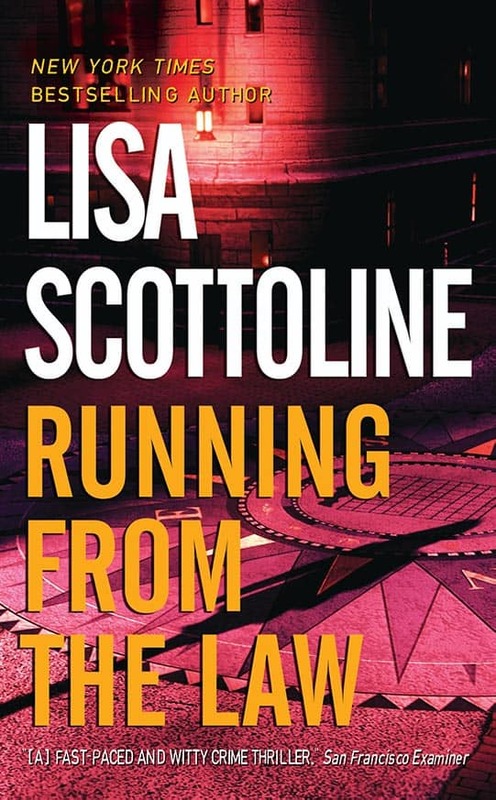 Running From The Law was Lisa Scottoline’s first hardcover book, and it received a glowing endorsement from Kirkus by earning a starred review. In it, wisecracking, poker-playing, Philadelphia lawyer, Rita Morrone takes on the defense of the Honorable Fiske Hamilton, a prominent federal judge accussed of sexual harassment, who happens to be the father of her live-in lover. But all bets are off when the case turns deadly, and Rita finds herself at the center of a murder. Any good poker player will tell you the secret to a winning bluff is believing it yourself. I know this, so by the time I cross-examined the last witness, I believed. I was in deep, albeit fraudulent, mourning. Now all I had to was convince the jury. “Would you examine this document for me, sir?” I said, my voice hoarse with fake grief. I did the bereavement shuffle to the witness stand and handed an exhibit to Frankie Costello, a lump of a plant manager with a pencil-thin mustache. “You want I should read it?” Costello asked. Costello bent over the document, and I snuck a glance at the jury through my imaginary black veil. A few returned my gaze with mounting sympathy. The trial had been postponed last week because of the death of counsel’s mother, but the jury wasn’t told which lawyer’s mother had died. It was defense counsel’s mother who’d just passed on, not mine, but don’t split hairs, okay? You hand me an ace, I’m gonna use it. “I’m done,” Costello said, after the first page. “Attachments?” he asked, cranky as a student on the vocational track. “Yes, sir.” I leaned heavily on the burled edge of the witness stand and looked down with a mournful sigh. I was wearing black all over: black suit, black pumps, black hair pulled back with a black grosgrain ribbon. My eyes were raccoony, too, but from weeks of lost sleep over this trial, which had been slipping through my manicured fingers until somebody choked on her last chicken bone. “Give me a minute,” Costello said, tracing a graph with a stubby finger. He labored over the chart as the courtroom fell silent. The only sound was the death rattle of an ancient air conditioner that proved no match for a Philadelphia summer. It strained to cool the large Victorian courtroom, one of the most ornate in City Hall. The courtroom was surrounded by rose marble wainscoting and its high ceiling was painted robin’s-egg blue with gold crown molding. A mahogany rail contained the jury, and I stole another glance at them. The old woman and the pregnant mother in the front row were with me all the way. But I couldn’t read the grim-faced engineer who’d been peering at me all morning. Was he sympathetic or suspicious? “I’m done,” Costello said, and thrust the exhibit at me in a Speedy Gonzales fit of pique. We don’t need no steenking badges. “This isn’t the first time you’ve seen these documents, is it, sir?” My voice echoed in the empty courtroom. There were no spectators in the pews, not even the homeless. The Free Library was cooler, and this trial was boring even me until today. “Yeh.” Costello shifted in the direction of his lawyer, George W. Vandivoort IV, the stiff-necked fellow at the defense table. Vandivoort wore a pin-striped suit, horn-rimmed glasses, and a bright-eyed expression. He manifested none of the grief of a man who had buried his own mother only days ago, which was fine with me. I had rehearsed enough grief for both of us. Costello paused, at a loss without the memo in front of him. Who can remember what they just read? Nobody. Who would ask for the memo back? Everybody except an Italian male. “I think so,” he said slowly. “Just so I’m clear on this, a blind copy is when you send a memo or letter to someone, but the memo doesn’t show that you did, isn’t that right?” A point with no legal significance, but juries hate blind copies. Even better, it sounded like the Mafia. I glanced at one of the black jurors, who was frowning deeply. He lived in Southeast Philly on the ragged fringe of the Italian neighborhood, and had undoubtedly taken his share of abuse. His frown meant I had collected six jurors so far. But what about the engineer? I tried to look sadder. “I’m proceeding as quickly as I can, Your Honor,” I said, looking innocently up at the dais. It towered above my head, having been built in a time when we thought judges belonged on pedestals. “Of course, Your Honor,” Vandivoort said, jumping up and hustling over. His mother’s death had put such a spring into his step that he almost beat me to the dais. An inheritance, no doubt. The court reporter, an older black man with oddly grayish skin, picked up the stenography machine by its steel tripod and huddled with us at the front of the dais. A sidebar conversation is out of the jury’s hearing, but not the appellate court’s. The word disbarment flitted across my mind, but I shooed it away. I didn’t know he cared. “Your Honor, I am tired. It’s been a long trial and I’ve worked this case myself. I don’t have the associates Mr. Vandivoort does, from Webster & Dunne,” I said loud enough for the jury to hear. “I noticed that, too,” Vandivoort added, as it began to dawn on him. “My sexism?” He practically choked on the word, since he fancied himself a liberal with a true respect for women. Like Bill Clinton. “I most certainly am! It’s absurd. Frivolous! You’d lose on appeal,” Judge Kroungold shot back, but he twitched the tiniest bit. I looked at Vandivoort, dead-on. “Can you really believe I would do such a terrible thing, George?” The pot is yours if you can call me a liar to my face. In open court on the record. Vandivoort looked at Judge Kroungold, then at me, and back again. “Uh…I have no objection,” he said, folding even easier than my Uncle Sal. Vandivoort was too much of a gentleman, that was his problem. Biology is destiny. It’s in the cards. What was this? Not according to Hoyle, surely. Judge Kroungold signaled to Wesley as soon as Vandivoort bounced away, and Wesley got the convenient urge to stop typing and crack his knuckles. Judge Kroungold leaned over the dais. “I’ve been reading about you in the newspapers, Ms. Morrone, so I can’t say I’m surprised by your showmanship. But I warn you. Play all the tricks you want. It might work in this case, but it won’t work in Sullivan. You’re in over your head in Sullivan. “Of course, Ms. Morrone,” Judge Kroungold said loudly. “Ladies first.” He leaned back and waved to Wesley to go back on the record. “Thank you, Your Honor,” I said, and turned to face my jury. But not before I remembered my bereavement and brushed an ersatz tear from my eye. Which is when I caught a glistening behind the engineer’s glasses. 1995© by Lisa Scottoline. All rights reserved. Running From the Law was Lisa’s first hardcover book. Do you prefer to read hardcovers or would you rather wait for the paperback? Is the print in the paperbacks too hard to read? Do you keep or pass on your books? Would you give away a hardcover? Lisa incorporated poker in her novel long before it became a new national pasttime. Are you as interested in poker as Rita Morrone? Why does she like it? What does it tell about her? Why are more women beginning to play? Are you worried about the new popularity of poker, especially among teens? Did you think Rita’s stunt in the courtroom verged on dishonesty, or was it just good lawyering? Is all fair in love and lawsuits? Rita defends a judge against a sexual harrassment suit. Are these types of lawsuits out of control or are they important for protecting those who are being mistreated? Do you think people abuse the sexual harrassment laws, thus making it more difficult for those with legitimate complaints? Was Rita obligated to defend her boyfriend’s father? Is it smart to defend a close relation? Do you think a client will be as honest with a lawyer with whom there is a personal relationship? Does it put the lawyer in a compromising position? Rita attends a funeral of a child killed by gang violence. Gang violence isn’t funny. Consider this: Lisa went to an actual funeral of a child caught in gang crossfire, to write this chapter. She had her pick. That summer there was one funeral every weekend. Is enough being done to control gangs. Is better education the answer? Can the promotion of reading help keep kids off the street? What did you think of the gang of elderly poker players? Did they ring true? Were they important to the story? What do you think Rita got from their relationship? What did the old men get from the relationship? Does Rita really just need a good girlfriend? Do you agree with who Rita married? Was it clear at the end who she chose? What do you think made Tobin so attractive to Rita? Would you like to read more about Rita? What about her poker buddies? Is Rita the kind of person you would like to be friends with? Why or why not?